I think I've posted this before, but in general, it takes a lot for a book to make me cry (or really scared for that matter). 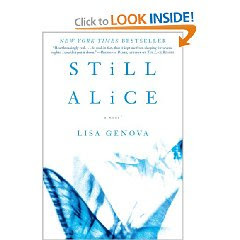 That being said, I was quite teary at several points while reading Still Alice, which is Genova's debut novel. Alice Howland is a distinguished professor of psychology at Harvard with a loving husband and three grown children. Everything is just peachy, until the day when she starts forgetting things, even going so far as getting lost in her neighborhood during an average run. After consequent trips to the doctor, Alice is diagnosed with early onset Alzheimer's Disease. The rest of the novel is spent on how she and her poor family deal with this awful illness. As her condition deteriorates, her sense of language and cognition starts to fail, thus leaving her frustrated and scared. The scenes between Alice and her husband were very heartwrenching - it must be impossibly difficult to care for a spouse with the disease. Genova is a neuroscientist, and therein lies my only criticism I have of this book - her writing style and usage of language and dialogue isn't nearly as fluid as she thinks it is. There was one line in the book about how Alice could tell "by looking at [her daughter] Anna's B-cup that she wasn't pregnant yet." Um, what? Other than that, it was still very much a moving book.